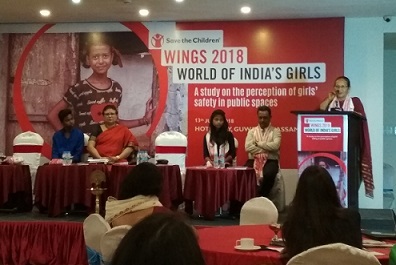 Save the children, a leading child rights NGO in the country, released a study report, “WINGS 2018: World of India’s Girls: A study on the perception of girls’ safety in public spaces” in Guwahati on Wednesday. The study was conducted in six States of the country including Delhi-NCR, Madhya Pradesh, Maharashtra, Telangana, West Bengal and three districts in Assam. The study focused on society’s’ perception of girls’ safety in public spaces. According to the study, one in three adolescent girls surveyed were scared of traversing the narrow by-lanes of their locality, roads to school and local market. Adolescent girls felt scared in over-crowded areas and public transport systems as they feared inappropriate touching and groping. On the other hand, 60 per cent of the adolescent girls felt scared in dim lighted streets. As per the report, nearly half of the girls surveyed do not complain about an incident or harassment to their parents in fear of being scolded or restricting them from going out of their house, in the case of reporting to the police, girls are either blamed or reluctance in recording their complains were found. The study also found that as many as half of the boys and parents surveyed believed that the best way for a girl to be safe is that girls should avoid certain public spaces or refrain from going out after dark. One in five parents surveyed believe that it is better to get their daughters married at an early age than to take the risk of something happening with her in public spaces. Majority of the girls lack awareness of child welfare committees. Around 90 pc of adolescent girls, who were exposed to stories on sexual assault on girls and women in the media have become more careful about where they go in public spaces. The minister also said more research, studies, workshops and discussion with experts on girls and child safety would bring solutions to such problems. Ajita Kullu, a 9th standard girl from Dhekiajuli, said, “Our country has received freedom, but girls yet to get freedom” and asked, “Why do girls have to feel like this?